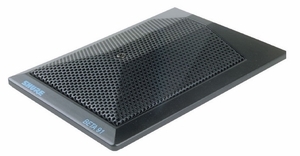 The Shure Beta 91� is specifically designed for kick drums and other bass instruments. The Beta 91 combines superior "attack" and "punch" for studio quality sound, even at the extremely high sound pressure levels encountered inside a kick drum. Its boundary effect design produces a strong, solid low-end response that has been specifically tailored for heavy bass applications. The microphone's cardioid pattern provides outstanding gain-before-feedback and excellent rejection of unwanted sound, making the Beta 91 ideal for live concert applications. The low profile design of the Beta 91 eliminates the need for external mounting hardware - just throw it in your kick drum and play. Polar Pattern Half-cardioid (cardioid in hemisphere above mounting surface), uniform with frequency, symmetrical around axis. Preamplifier Output Clipping Level (20 Hz to 20 kHz, less than 1% THD*) 2.5 kilohm load: 6 dBV (2.0 V) 1 kilohm load: 2 dBV (1.26 V) *THD of the microphone preamplifier when applied input signal is equivalent to the cartridge output at specified SPL.